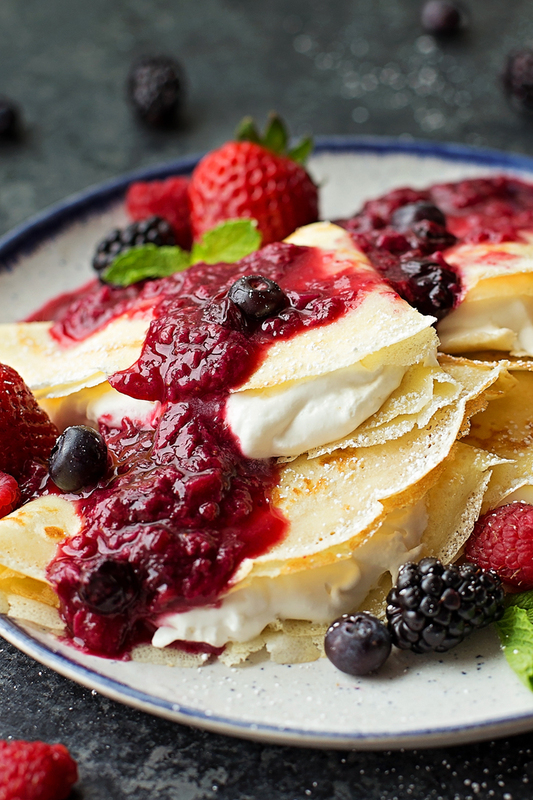 Homemade berries & cream blender crepes. 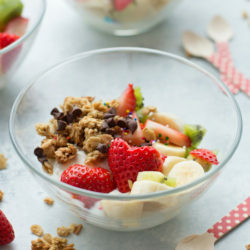 These are easy to whip up and perfect for special occasions or brunch! 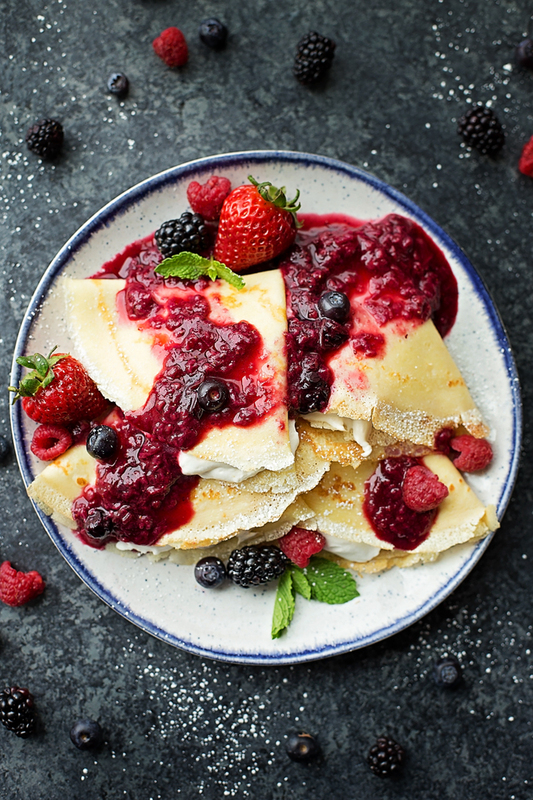 Mother’s Day is right around the corner and I can’t think of a better way to celebrate than with homemade crepes! 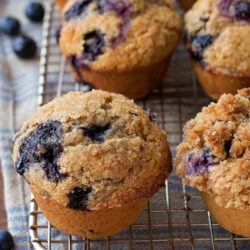 These would be perfect for breakfast in bed or mid-morning brunch. 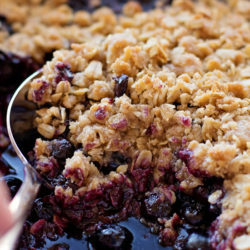 I opted to fill mine with fresh whipped cream and a homemade berry sauce- both super simple! 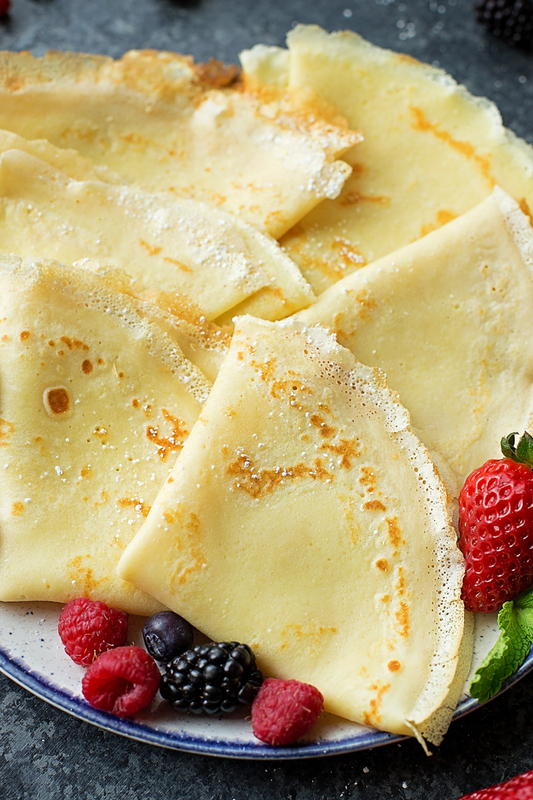 These crepes look and taste like you slaved all day (or morning) making them, but really they only take about 30 minutes. You can even mix up the batter the night before and let it chill overnight! Pour all of the ingredients into the jar of a blender. For the batter you’ll need to grab milk or half & half (if you use milk, use whole), butter, vanilla, eggs, flour, sugar, and salt. I swung by my local Harmons Grocery to pick up all of those ingredients, plus some of their private label heavy whipping cream for the filling, and of course, fresh berries for the sauce (they always have such good looking berries). While the crepes were cooking (this is a time consuming process so be aware of that, it’s not like pancakes where you can do multiple at a time unless you have several 10-inch skillets), I simmered the berry sauce and rinsed the remaining fruit. As soon as the crepes were done, I folded them into quarters, filled them with freshly whipped cream and then poured the sauce over top. I gave them a little dusting of powdered sugar and then we dug in! Everyone was obsessed!! 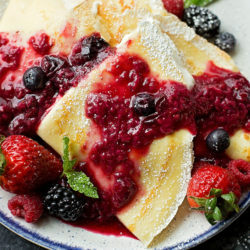 These berries & cream blender crepes are beautiful and delicious. They can be filled with just about anything (think peaches and cream or bananas and Nutella) and can rolled, folded or even transformed into a stunning layered “cake.” If you’re looking for something to make for Mom this year, you’ve gotta give these a try- she’ll LOVE them! In the jar of a blender, add the milk, melted butter, vanilla, eggs, flour, sugar, and salt. Blend on low until well combined, about 15 seconds. Place in the refrigerator to chill for 30 minutes. Just before the batter is ready to be used, in a small saucepan set over medium heat, combine the berries, sugar, water and lemon juice. Allow to simmer while the crepes are cooking. You can pour it through a mesh sieve if you prefer a seedless sauce. Place a 10-inch non-stick skillet over medium heat (or slightly higher). Stir the batter, then butter the pan. Remove the pan from the heat, pour 1/4 cup of the batter into pan, and swirl in circular motion to evenly coat the bottom of the pan with batter. Cook until golden brown on bottom, about 2-3 minutes. 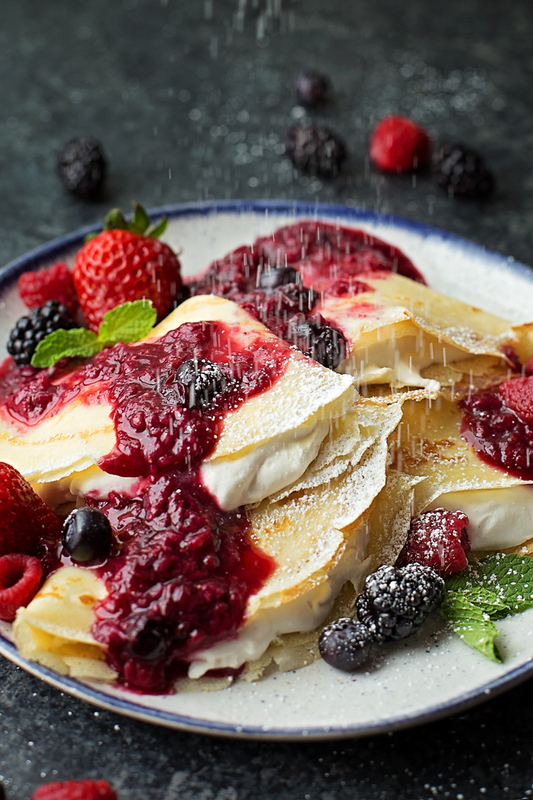 Flip the crepe and continue cooking for 1-2 minutes. Transfer to a wire rack and allow to cool. To prepare the whipped cream, in a large mixing bowl (with a hand mixer) or the bowl of a stand mixer, whip the cream, powdered sugar and vanilla until stiff peaks form. 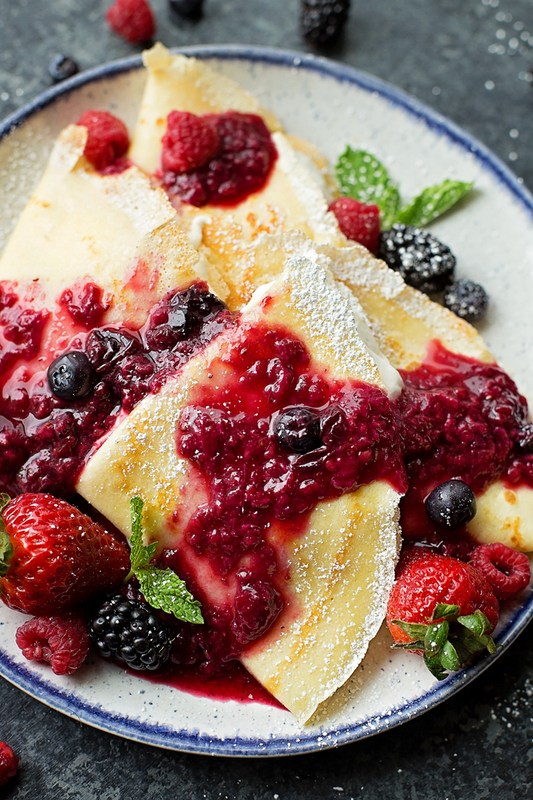 Roll or fold the crepes and fill with whipped cream. Top with berry sauce and powdered sugar, if desired. Don’t have berries? Try fresh peaches with whipped cream or bananas and Nutella!